DOH Sec. Francisco Duque led the groundbreaking ceremony for the Bohol Youth Home in Cortes. He was joined by Gov. Edhar Chatto and other officials including DSWD-Central Visayas director Evelyn Macapobre, DOH-7 director Dr. Jaime Bernadas, Cong. Rene Relampagos, Provincial Board committee on health chairperson Jade Bautista, Mayor Iven Lim and Vice Mayor Leo Pabutoy of Cortes. 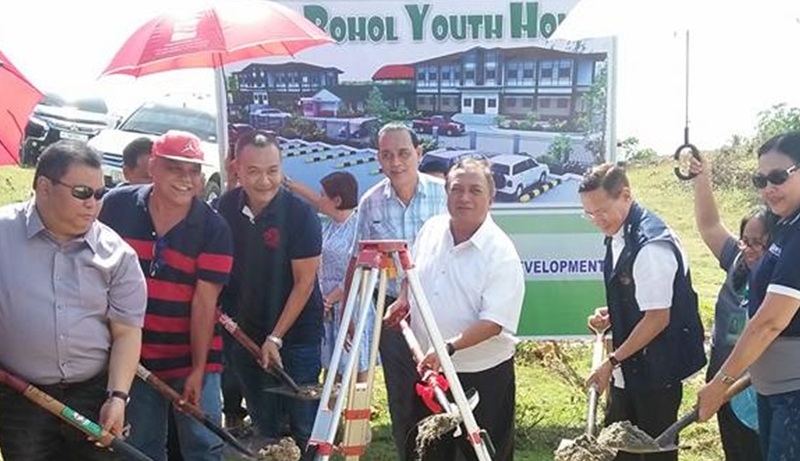 Department of Health (DOH) Secretary Francisco Duque on Wednesday led the groundbreaking ceremony for the Bohol Youth Home, a facility for underage delinquents, in Cortes town. The P90-million project will be funded by the provincial government, Department of Social Welfare and Development (DSWD), and the DOH. “This is a worthy project of the provincial government of Bohol, this is really aligned with the wellness and objective of the Department of Health,” said Duque. For her part, DSWD-7 director Evelyn Macapobre said that juvenile offenders in the province will be housed in the Bohol Youth Home instead of in facilities in Cebu. The Bohol Youth Home will be constructed on a 1-hectare land owned by the provincial government in Barangay Malayo Norte in Cortes which is also the site for other proposed healthcare infrastructures. A new facility of the Governor Celestino Gallares Memorial Hospital (GCGMH) and a drug rehabilitation center will also be constructed at the site which has a total land area of 24 hectares. Meanwhile, Duque also inspected the proposed site for the multi-million hospital. The health secretary arrived at 10 a.m. Tuesday to keynote the 16th Barangay Nutrition Scholar (BNS) Summit at the Bohol Cultural Center in Tagbilaran City.